ALL YOU GOTTA DO IS JUST START. I like to use stationary and get colorful with pens and markers and stickers etc but don't let that discourage you. 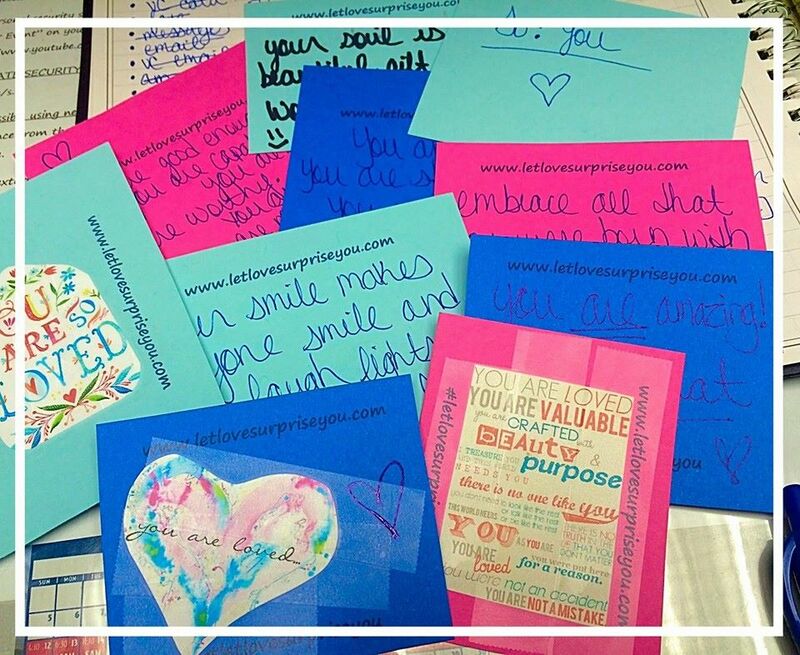 People have written on sticky notes, in greeting cards, or just on white paper. As long as you write, someone has a chance to be inspired and feel loved. Just write wherever you can, and if you're into it, make it pretty. I know this part seems like the most difficult but it is actually not quite as hard as you may think. Whenever someone asks me this question I often tell them, write whatever you like that would make someone smile or feel special. *If you are having a hard time starting, just look up a motivational quote and just write that. It's ok.
*If you want to get deeper, find a motivational quote and then write a short note expanding on what it means to you or how you relate to it. I love doing it this way the most because the quotes help me with ideas on which direction to lead the note. * Check out some prompts such as Life lessons you have learned this past year that have helped you the most, and What does love mean to you? or How do you get through hard times? *And lastly, don't be afraid to get personal. Don't be afraid to write a letter to yourself about exactly what YOU need to hear. Think about a situation you need help with, and write yourself as if you were writing a friend to lift them up. I bet you there is someone out there that can relate, that you can inspire, and with the intention, the person that needs your words, will find your letter. Inspire yourself in the process! HOW TO ADDRESS IT and HOW TO SIGN IT? I address it many different ways. Sometimes I write Hey Stranger, but I know the word "stranger" can feel distant so I also write Hey Friend. You can get clever, write Hey You, Hey Love, Hello Beautiful, or just start writing your letter, no address needed. As far as ending the letter I sometimes sign it with my name, Love, Ashley, if it feels really personal. I sometimes sign it with Love, ME. or XoXo, a stranger. Whatever you want is up to you and how you feel at the time!!! There is no right or wrong. HOW TO INCLUDE THE WEBSITE? I usually write the website www.letlovesurpriseyou.com at the bottom of the letter with no explanation. Sometimes I will write join the movement here, right before it. Sometimes I include it in the letter, letting others know the letter they found is a part of the movement. However you would like is awesome, just don't forget to include it. It leads people to encourage them to pay it forward, passing the love along further. You can go one step further and add the hashtag #letlovesurpriseyou as well. If they are savy they will know what to do with it. This is one of the fun parts. 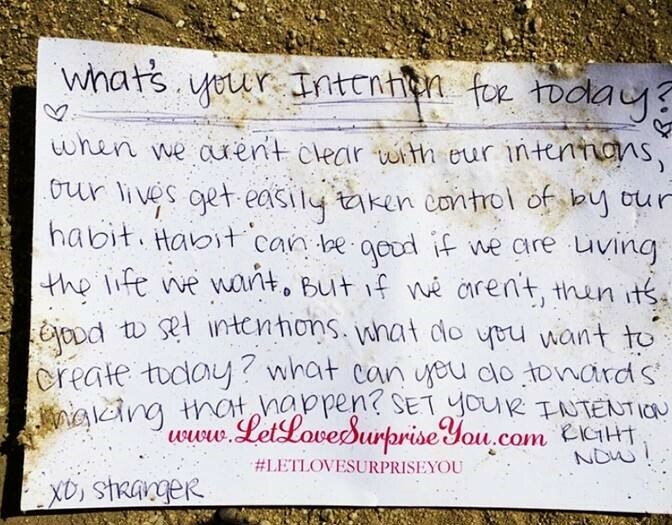 Write whatever you think will get someone's attention to know that this letter is for THEM. I write different things almost every time I write. I try to get creative. 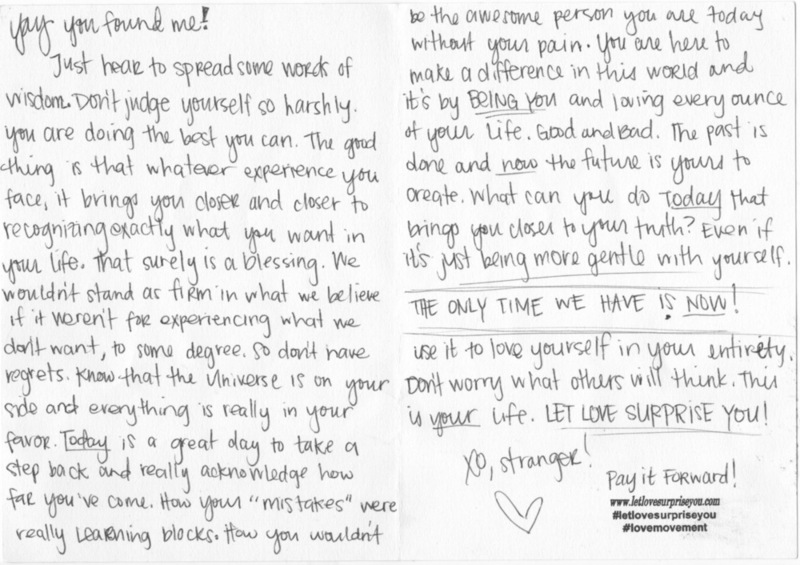 Hey Stranger, this is for you! Yes You! or If you are reading this, it is for you. A "yes you!" is always fun to add to it. Yay, you found me! now hurry and open me! or Read me read me, please read me! I know you can get creative, here is your chance. Again, another fun part. Leave it wherever you feel called. Have fun. Leave it on a bench, in a bookstore, in the bathroom, in some pant pockets, on a chair, taped to a pole, on a car windshield, hand it to someone. Wherever you leave it is special to you, just leave it with the intention that the right person will find it at the write time. I have stayed and tried to see who would get my letter and plenty of time I see people pass it up, but it is usually when that happens that the person that does pick it up, knows it was meant for them. If it falls on the floor, leave it. This is a chance to practice trust!!! Listen to your heart and leave it where it feels good!